Let me just say, this was delicious. I LOVED it! You should make it. Soon. 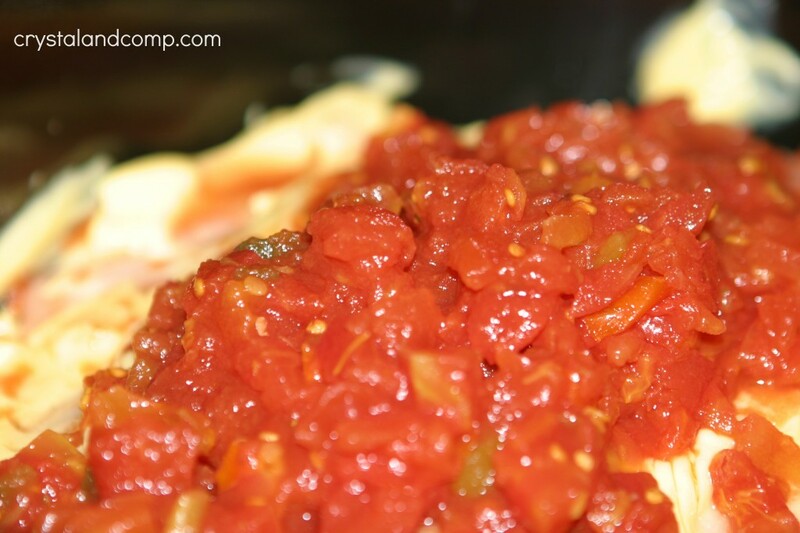 It is a great way to incorporate summer vegetables and cook dinner in the crockpot which is perfect for a busy family. Here is how you make this tasty meal. 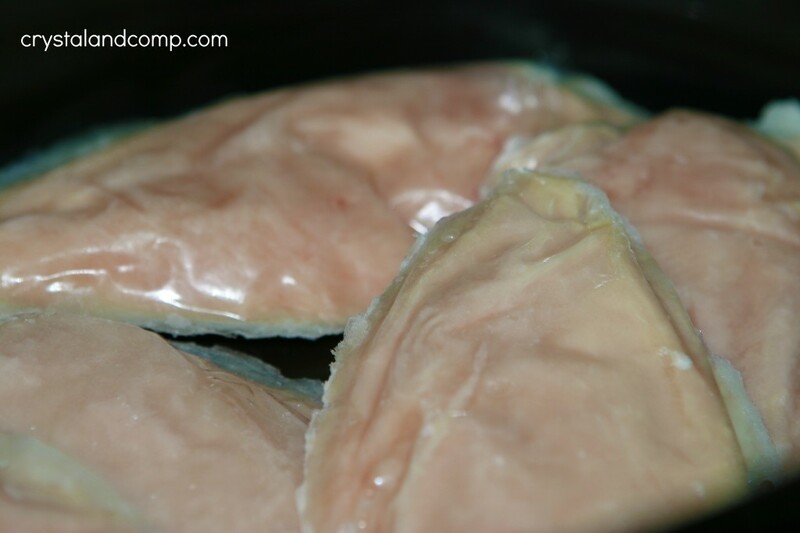 Place your chicken breasts in the crockpot. I put mine in frozen. Pour the soup and tomatoes over the chicken. 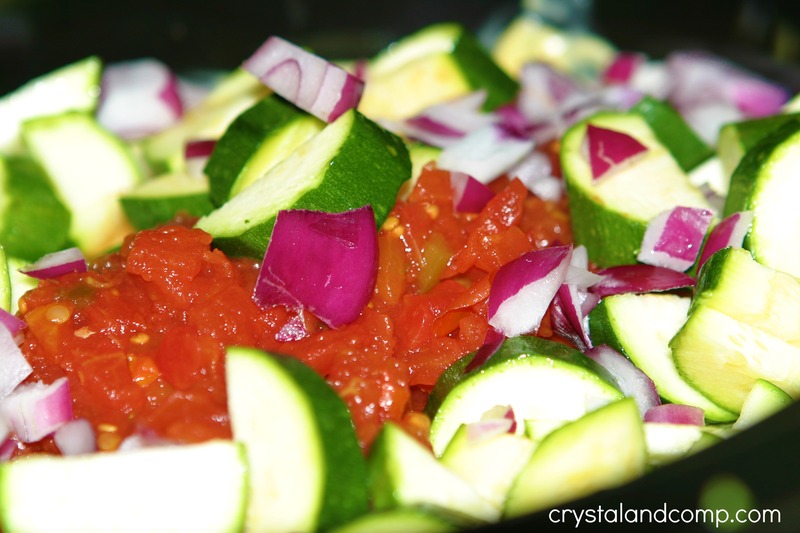 Toss in the onion and zucchini. 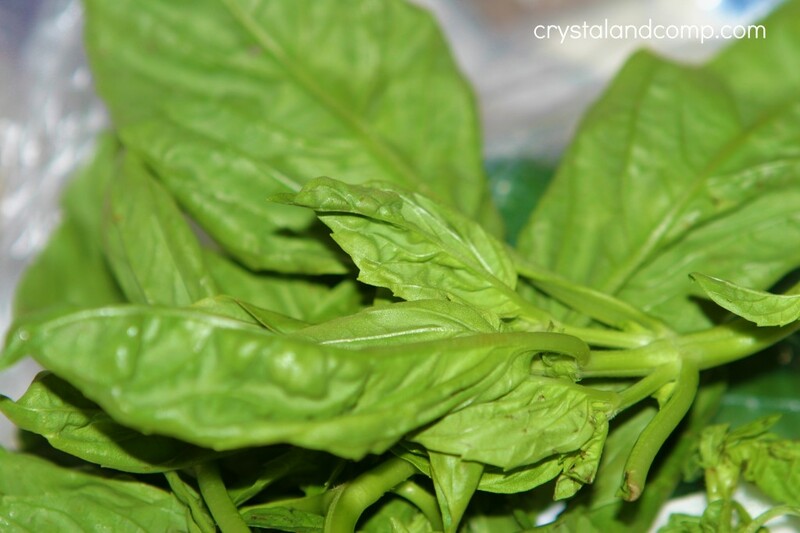 Tear up a palm-full of the basil. Also pour in the balsamic vinegar. Put the lid in it and let it cook on high for 4-6 hours or on low for 8-10. About 20 minutes before the crockpot is set to finish, bring a large pot of water to a boil on the stove. Boil the pasta according to the box direction. 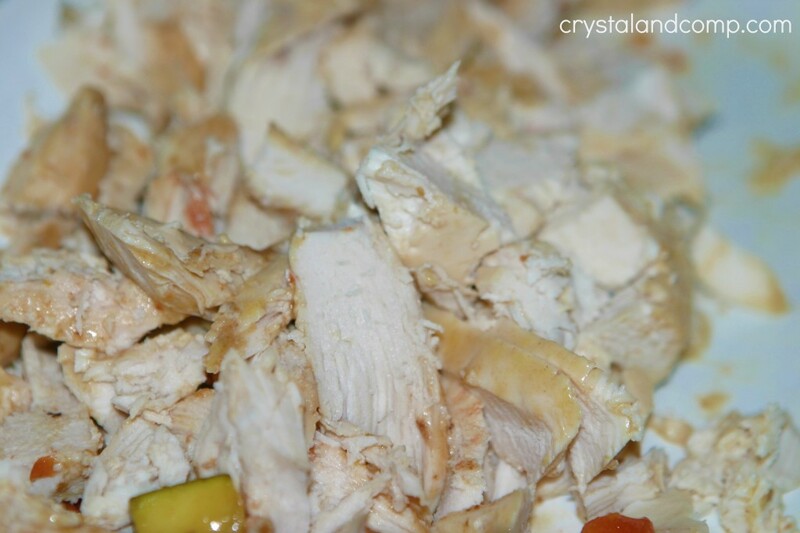 Once the crockpot goes off, remove just the chicken breasts and shred them. Toss them back in the crockpot. Drain the pasta once it is done. Grate a cup of cheddar cheese. Doesn’t my cheese look weird? I have a crisper drawer in my fridge that can be set to a freezing temperature if you want to. Looks like my kids pushed the freeze button because my deli meat and cheese were frozen. Cheese crumbles when it is frozen and you attempt to shred it. Toss the cheese into the crockpot. 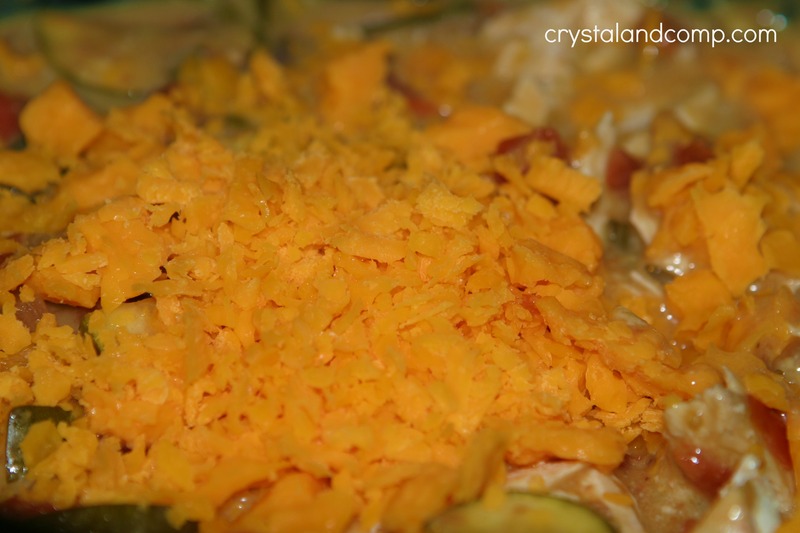 FYI: Frozen cheese does not want to melt in the crockpot. Plate it up and serve with a dinner salad and rolls if you want. We ate this for two nights. The second night I just tossed it back into the crockpot and heated it up on low. The cheese eventually melted. This looks gorgeous. We eat a lot of pasta in the summer–it’s just too hot to cook very much! Thanks for posting this. Thanks for your sweet words, Collen. I hope you’ll give it a try. This was so yummy. I wish I had a better picture where the cheese was melted 100%. 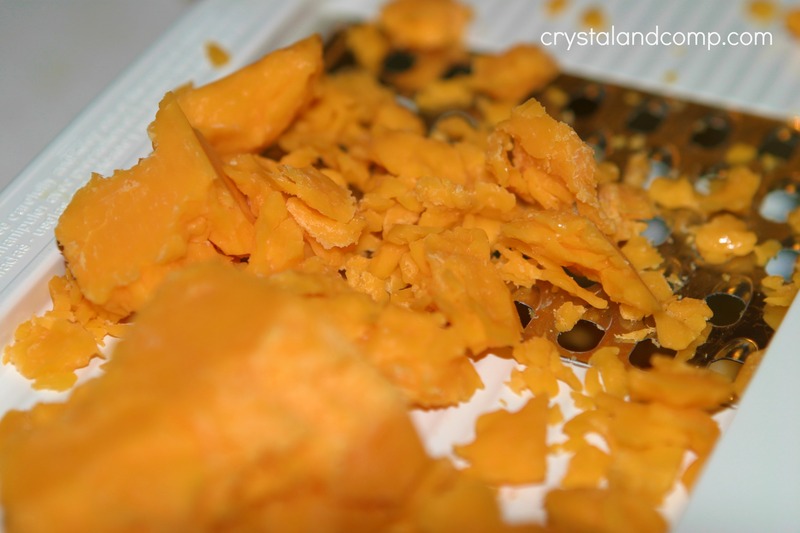 Who knew cheese did funny things when it is frozen…. 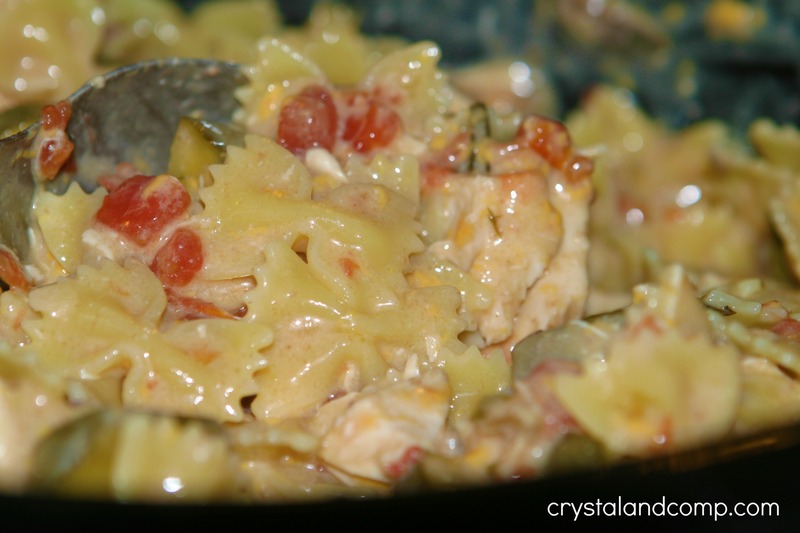 I agree that pasta is perfect for the summertime! This looks so delicious. I have some zucchini that needs to be used up. New follower from Whatever Goes Wednesdayz. Cindy, you don’t actually cook the pasta in the crockpot. You add the cooked pasta as one of the final steps. Love how simple this recipe was. The only downfall I saw to this was that it was very soupy…not sure what I did wrong. Do you drain the tomatoes? I have saved all of your posts thus far to go back and look at it. Nicole- What size crockpot did you use? I used a 6 qt, which means that as the ingredients cooked through the day (so this is minus the pasta) the crockpot was only half full, which helps it cook faster and will prevent a soupy mixture. If you cooked in a 4 qt crockpot, you will want to cook it on high for longer to reduce the liquids. How long did you cook it on high for and what size crockpot did you use? When do I add the chicken soup? Kala- you put the soup and canned tomatoes over the chicken. 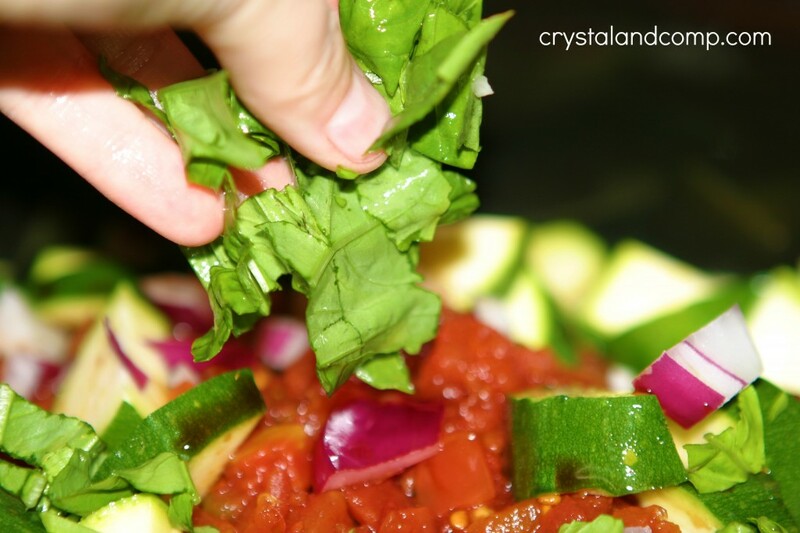 Then add the veggies and basil, etc., and cook on low for 8-10 hours or high for 4-6. On thank you so much. I wish it were 4 hours from now. This looks so tasty. How many people does this feed? I am looking to feed 25 and was wondering if I should triple or more the recipe. Thanks! This will easily feed 6 people- adding more chicken and pasta can extend that. I would triple it if you need to feed 25 and maybe add a little more chicken just to play it safe. I love all things crockpot/ slowcooker!!! You are my hero. I am Plan to Eat – ing practically your whole website. You’re going to love it, Carrie! We did! It was awesome…enjoyed leftovers today. 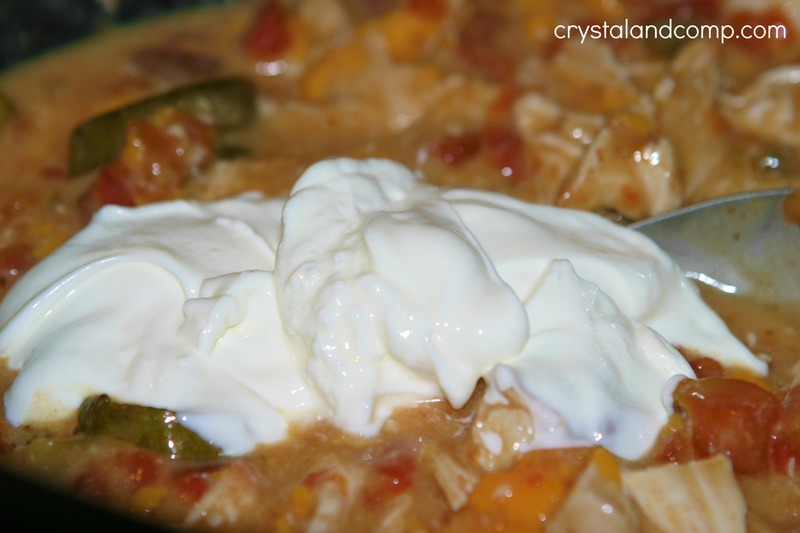 I had the same problem as one of the commenters above with it being soupy (we have a little crockpot), but we just scooped out the chicken and veggies and mixed the cheese/sour cream/pasta in with it all in another bowl. I think I need a bigger crockpot. 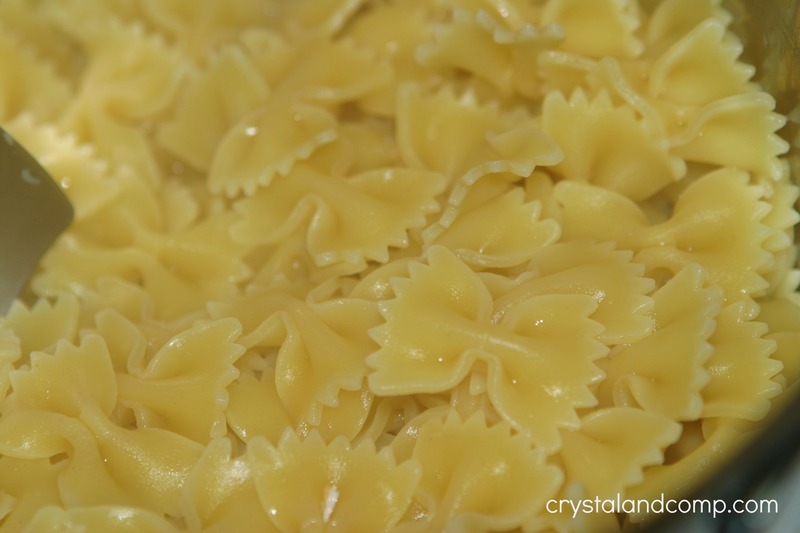 What size is the “box” of bowtie pasta? Looking forward to trying this recipe in the next couple of days! Marianne- the boxed pasta is generally 12 oz. That is what I used in this recipe (12 oz). But, you could certainly use a bag which is usually 16 oz, especially if you want less coated noodles. Hope that helps. It would be hlepful to include nutrition information with all recipes. 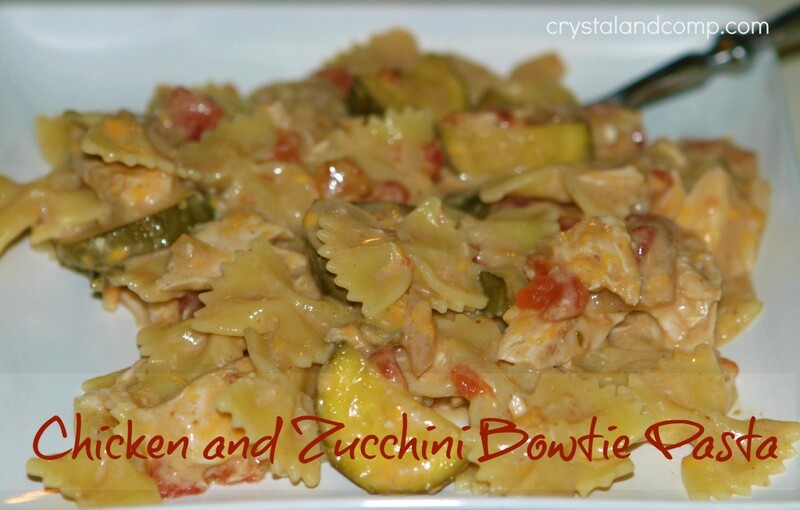 I’ve made this twice now and it was a major hit each time!! Even my picky almost 2 year old eats it! It is so delicious! Thank you for all your recipes! You are a lifesaver in this house! Yay Kelli, that is great to hear. I love that you can work in so many veggies in this recipe. If I use thawed chicken how long should this take? If you’re using thawed chicken it should cook in four hours on high opposed to six. It’s delish! Hope you love it! This was delicious. Next time I am going to add a pepper jack cheese to give it a little kick. Heather- that sounds like an awesome variation. I am so glad you liked it! Should the ingredients be stirred? Will the zucchini cook well if it’s left on top? 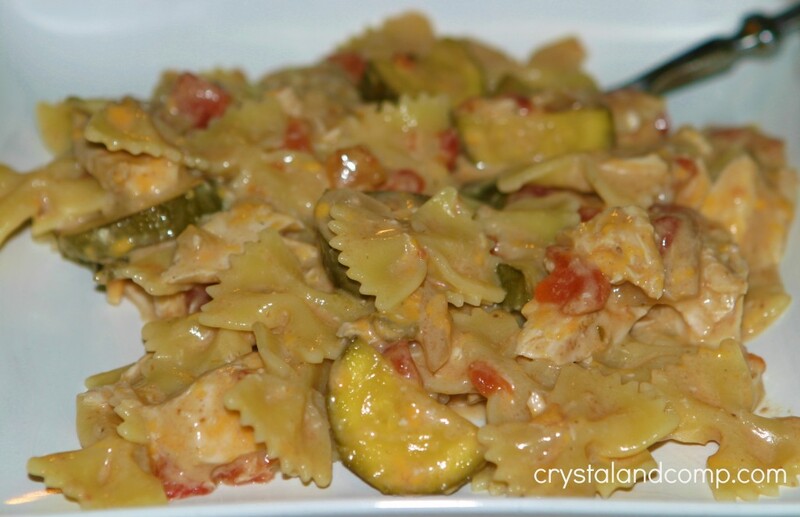 I have this in the crock pot right now and I’m so excited! If I wanted to add mushrooms, how long would they need to be in the crock pot? I did not stir it, I just dumped it all in. I would add the zucchini on top. It will cook just fine. Add mushrooms if you want. That sounds delish. Add them when you add the zucchini. Thank you for your response! We loved it and will definitely be making it again!! I can’t wait to try your other recipes! I made this tonight with chicken leg quarters, it was awesome! Although, I had a zucchini from my garden I used and the skin got hard. I would peel it next time. This dish tasted just like a cream of tomato soup I make. People if you see this recipe, DO IT!